Not all Swiss watches are created equal. The watches in the Wenger GST series are prime examples of how precision engineering need not appear fussy or needlessly complex. The bold styling of the GST Chrono 78254, unashamedly announces its owner as someone not to be taken lightly. Which is essentially the same attitude conveyed by the Swiss citizen-soldiers who were the original recipients of the genuine Swiss Army knife. GST Chrono 78254 Swiss Watch. 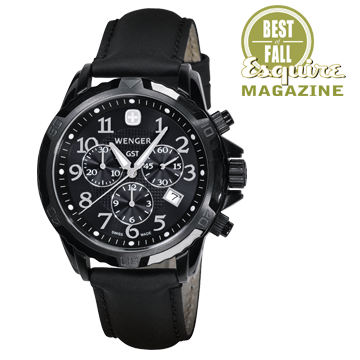 Check out all Wenger Swiss Watches.